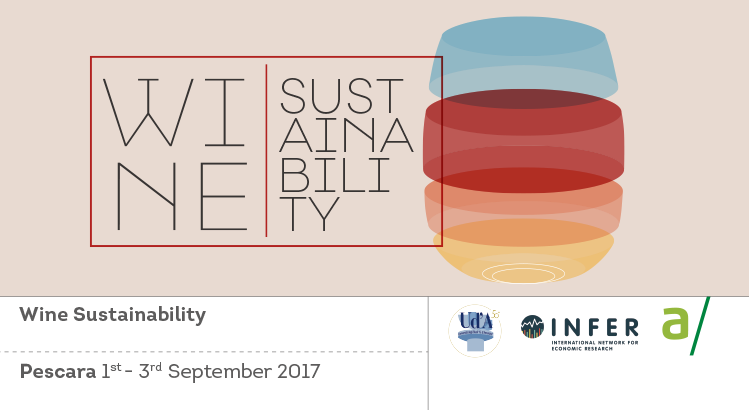 a/simmetrie is organizing with the Department of Economics, Gabriele d’Annunzio University, Pescara (Italy) and INFER – International Network for Economic Research (Bonn) an international conference on Wine sustainability. The conference will take place at the Faculty of Economics, University Gabriele d’Annunzio in Pescara (Italy), on September 1st-September 2nd, 2017. Download here the call for papers. Over the last decades the wine market has changed dramatically. While until the ‘60s the production and consumption of wine was concentrated mainly in Europe and the Mediterranean countries, in the ‘70s new countries started massive investments which led to an increase in both quantity and quality. At the same time there has been a number of technological innovations in both agronomy and oenology whose effects on wine authenticity and on the environment are debated. The wine sector is therefore facing sensitive socio-environmental issues: The consumers’ expectations, like especially health issues and environmental concerns, the supply conditions, especially climate change, and the increasing competition raise new challenges in terms of sustainability. The sustainability might become a driver of the supply, the demand and a vector of competition in the future. This conference provides an opportunity for all those interested in the issue of sustainability in the wine sector, to discuss their research and to exchange ideas. Researchers are invited to submit both empirical and theoretical papers that are broadly consistent with the conference’s special topic. Crowdfunding in the wine sector: a way for adopting sustainable production process? Karl Storchmann is Clinical Professor of Economics at the Department of Economics of New York University NYU, founding and managing editor of the Journal of Wine Economics, and vice-president of the American Association of Wine Economists. He has taught or held visiting positions at many universities, including Yale, UCLA, Whitman College, Paris II Panthéon-Assas, and Bordeaux. His research interests encompass topics related to agricultural, energy, and environmental economics, and his recent research focuses on the impact of climate change on the wine industry. He has published in journals such as American Economic Review, Review of Economics and Statistics, Agricultural Economics, Energy Economics, or the Journal of Wine Economics. Julian M. Alston is a distinguished professor in the Department of Agricultural and Resource Economics and the director of the Robert Mondavi Institute Center for Wine Economics at the University of California, Davis. Among other honors and distinctions, he is a Fellow of both the Agricultural and Applied Economics Association and the American Association of Wine Economists. Alston is an agricultural economist known for his work on the economics of agricultural and food policy. His recent projects have emphasized science & technology policy and the economics of agricultural innovation; food & nutrition policy, and the global challenges of poverty, malnutrition, and obesity; and wine economics. He has published many research articles, chapters, and books on these subjects—most recently, The Effects of Farm and Food Policy on Obesity in the United States (2017) with Abigail Okrent. Massimo Del Gatto, Gabriele d’Annunzio University. Further information on paper submissions, conference registration, accommodation opportunities, etc., is provided in the call for papers or can be asked at the conference secretariat (eventi@asimmetrie.org).